Another edition of ASTC On Air was streamed live on Friday, February 24. We talked with Athanasios Kontonikolaou, general director of NOESIS—The Science Center and Technology Museum of Thessaloniki in Greece, about why and how his institution launched a program serving refugees in his city, which has seen a massive influx of new people during the past few years. Watch the recording below. NOESIS offers the public an environment that leads to a better the understanding of natural sciences and technology, and it is actively involved with topics related to the culture of science and technology. Its main objective is the popularization of modern knowledge and its dissemination to the public, as reflected in its brand name, “noesis,” which means “the exercise of reason” within the ancient Greek philosophical tradition. The institution aims to emphasize the connection between its operation and the human intellect, since the intention of its founders was to make scientific knowledge available to everyone. Kontonikolaou has been the general director of NOESIS since 2010, having served as the technical director since 2002. 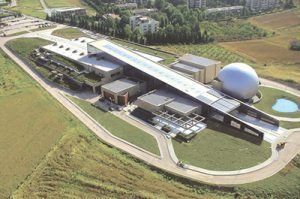 He studied electrical engineering at Aristoteleio University in Thessaloniki and before joining the science center field worked as a head construction engineer in electromechanical infrastructures, in project design, and in supervising construction projects such as malls, hospitals, theaters, and banks. For more examples of how and why science centers and museums around the world are working toward greater inclusion, see the current, special edition of ASTC’s magazine, Dimensions. In its pages, institutions from across the globe describe how they are serving immigrants, migrants, refugees, and internally displaced people; examine how they are working to build and engage audiences, staffs, and boards that are diverse by many measures, including by race, ethnicity, national origin, native language, immigrant or refugee status, sexual orientation, gender identity, ability, and socioeconomic status; and discuss where more can be done. ASTC on Air is an online series featuring interviews with people—from both outside and inside the science center and museum field—who are doing work that is relevant and interesting to informal science and museum professionals.